NEW DELHI – It is four times taller than the Statue of Liberty. So big, in fact, that it will give India bragging rights to the world’s tallest statue – a nearly 600-foot creation that says as much about India’s global aspirations as it does about the political ego of its leader. It may seem like a natural choice for an outsize tribute. 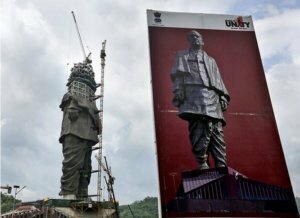 India’s new Statue of Unity, to be formally unveiled Wednesday, depicts Sardar Vallabhbhai Patel, an independence-era leader credited with uniting the fledgling nation in the 1940s when he served as India’s first home minister. But the homage to Patel has far deeper symbolism. Patel, known as India’s “Iron Man,” has become a right-wing icon for Hindu nationalists. And the statue’s location, in the western state of Gujarat, has been the site of some of the fiercest clashes between Hindus and Muslims in past decades. The $408 million gold-colored colossus also spills over into present-day politics. It is seen as a trifecta for Prime Minister Narendra Modi: a nod to his Hindu political base, a landmark site in his home state, and a showcase of the nation’s growing prosperity and status as a rising global power. Hindol Sengupta, author of a Patel biography, said projects such as the statue are Modi’s way of trumpeting India’s ascent. It will stand at 597 feet, or 177 feet higher than the current world’s tallest statue, China’s Spring Temple Buddha in the central Henan province. Ironically, the bronze cladding for the Patel statue was shipped from China because Indian foundries lack the expertise and equipment to go this big. The statue is being assembled by around 4,000 laborers working around the clock. The golden statue depicts Patel, wearing a traditional Indian dhoti wrap around his legs and a shawl, towering over the Narmada River. In 2013, ahead of the previous general election, Modi sent trucks all over India to collect scrap metal for the structure. According to the statue’s makers, the metal was melted and used to create the structure’s base – a symbolic act to represent the nation. A museum and audiovisual gallery underneath the statue will showcase Patel’s life story and his contributions to India’s independence struggle. Wednesday’s unveiling also is viewed as the unofficial launch of Modi’s campaign for re-election next year. He already has another giant statue of a warrior king in the state of Maharashtra, set to be ready by 2021. Some critics cringe at the images intended to project wealth and power. Art historian Shukla Sawant called it “paternalistic” public art. “It’s the size matters, kind of a nonsensical, idea of power,” said Sawant, a professor of visual studies at Jawaharlal Nehru University in New Dehli. Still, Modi seems to relish the big-splash attention of the projects. “If Sardar Patel had become the prime minister, today a part of our beloved Kashmir would not have been under Pakistani occupation,” Modi said to Parliament in February. The statement was a dig at India’s first prime minister, Jawaharlal Nehru, whose vision for a secular, multifaith India clashes with the pro-Hindu politics of Modi’s Bharatiya Janata Party, or BJP. The Statue of Unity is a near-replica of a Patel statue at an airport in the nearby Gujarat city of Ahmedabad.